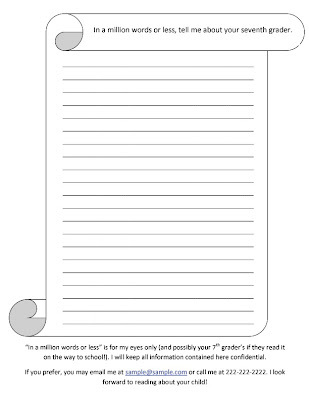 Mrs. ReaderPants: First week of school activity: "In a million words or less..."
First week of school activity: "In a million words or less..."
GoogleDoc for the above image. If the upload does not work for you, please email me, and I will send you the original. Once upon a time, before I became a school librarian, I taught seventh grade ELA. One of my favorite, favorite beginning-of-the-year activities was not for my students. It was an assignment for their parents. It did not have a specific due date, but it was SUCH a great tool for me to get to know my students at the beginning of the school year. "In a million words or less, tell me about your seventh grader." Parents (or guardians in some cases) WANT to brag about their kids. They know their children better than anyone on earth. They almost universally want them to be successful in life. They love their child unconditionally and have more insight into their child's mind than anyone else. You know the students will read what their parents say, and that is a good thing. I never had one letter in the three years I taught where the parent was negative. Every child is great at something, but that something might not be school. The students get to see all the nice things their parents say. How often do you think seventh graders hear this from their parents? I can identify potential issues right at the beginning of the year. Many parents include things they are worried about for their children for this school year. Ronnie was bullied in sixth grade, Tammy hates reading, Jessica's dad just died, Paul just moved here and isn't adjusting well, and on and on and on. These are not often things the students will just come out and tell you, but they are okay with their parents telling you. Parents know I'm interested in their children. Many parents include contact info that the office doesn't have on their forms. Good info there! I could connect with the kids on a personal level, right from the start. Kimber likes to crochet? I've been wanting to learn that! Zack's parents are divorcing? Mine divorced when I was in middle school, too. Ryann loves scary movies? Maybe I can recommend some horror novels to her! I identified potential "high maintenance" parents. Also good to know. I learned what my students were good at. Not everyone is good at school, but everyone is great at something. I found out right away so I could use that to help my students be successful in my class. The letters from the parents gave me insight to the parents' education and ability to speak English. Yes, some might be too intimidated to write to you, but you'd be surprised how many will still write, despite their own language/writing challenges. It's not only what they write; it's what they don't write. One year, I had a student write her own "in a million words or less" paper because her parents were "too busy." Whether this was true or not about her parents, it was this young lady's reality. In her eyes, her parents were "too busy" to write about her, which speaks volumes also. If the parent includes an email address or phone number, follow up with them in the first few days to let them know you enjoyed reading about their child and thanking them for taking the time to tell you about their son or daughter. Be sure to acknowledge any concerns the parent might have written about. This follow-up doesn't have to be long, but acknowledging the parents' concerns lets them know that you are in fact reading what they wrote and using the information to help their child. I didn't do this, but in retrospect, I wish I had written a "disclaimer" at the bottom of the colored paper. It would say that the "Million Words or Less" papers would be for my eyes only (and maybe their child's) and that they could email or call me if that works better for them. I included this disclaimer at the bottom of the attached printable sheet. This project is so open-ended that some parents might fill both sides (or more), and others might only write a sentence or two. Either way, I learn something about the family I'm about to spend the year with. Tell your students about this assignment (don't just stick the paper in with a stack of 50 other back-to-school forms). The students will get excited about this assignment, and you know if they are excited, they'll make sure their parents see it. 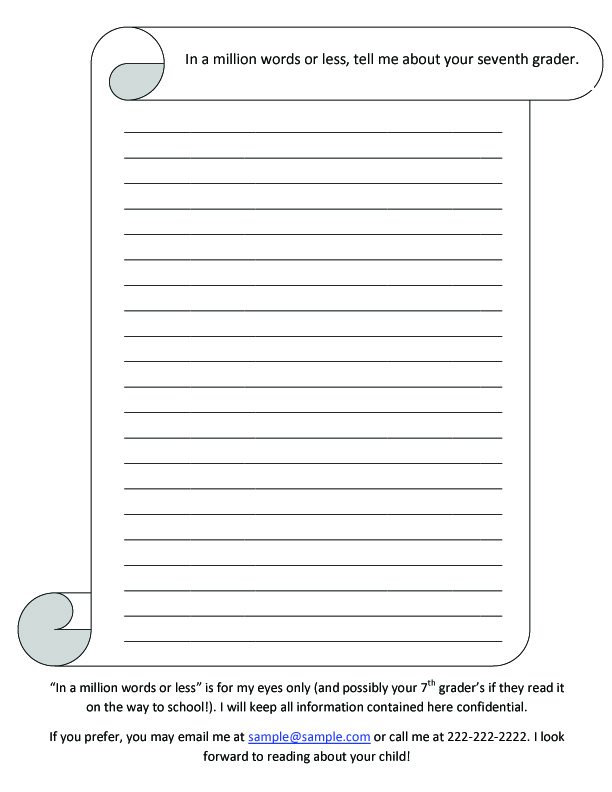 Give your students a chance to tell you about themselves in "a million words or less." This would make an easy first-week journal assignment.